Queen City Tune Up didn't get through Sunday, but there's plenty of results to measure. Around the country, the season is rolling, including in D-III! College Update is presented by VC & Spin Ultimate; all opinions are those of the author. Please support the brands that make Ultiworld possible and shop at VC Ultimate and Spin Ultimate! During the spring season, we will publish a bite-sized weekly recap of the action across the College Division. This will serve as a supplement to our standard tournament reporting and will offer a high-level look at the latest happenings and the biggest stories of the week. The one opponent that overcame all others in Charlotte? The rain. A chilly downpour Sunday morning ended the tournament about 60 minutes into the first round of the day at Queen City Tune Up. It’s hard to apply much weight to saturated victories earned by #16 Ohio State over #1 Dartmouth, #11 Tufts over #8 North Carolina, #7 Carleton over Georgia, and #9 Pittsburgh over #13 West Chester in the abbreviated action. On Saturday, Dartmouth, Carleton, and UNC went undefeated with impressive play. Dartmouth played without some of their championship-winning stars, Jaclyn Verzuh and Piper Curtis, but still could have won the tournament. Meanwhile, Carleton’s 4-0 day came in impressive fashion, with depth to spare and great skill on display. North Carolina’s pressure and pace, exemplified by the play of Jenny Wei, were their best weapons. With 20 teams and 80 full games, there’s lots to go over, so for full coverage of QCTU, check out our tournament recap! #21 UC Santa Barbara followed up a breakout showing at Santa Barbara Invite with a scorching run through the Presidents’ Day Qualifier. Their 91-30 scoring margin included just a single close game, a 13-10 victory in the final against Cal Poly SLO. Their freewheeling up-tempo offense overwhelmed their competition game in and game out. They’ll be a dangerous landmine in the Presidents’ Day field. It’s also another strong result for SLO, who continues to knock on the door in the strong Southwest. Wake Forest avenged a Saturday loss to Virginia Tech by demolishing them in the final of Hucking and Shucking, to the tune of 13-2. The only D-III women’s team to see action this weekend was #18 Catholic Nun Betta at Hucking and Shucking; they performed well against the B teams from William and Mary and North Carolina, with a tight loss to Wake Forest in pool play, and they fell 12-5 to Virginia Tech in their semifinal. Overall, it was a good growth weekend for the ladies from DC, but not enough to jostle them from their perch in the Power Rankings. Next weekend, watch for a whole swath of the division to be in play for rankings as teams from the Southeast, Southwest, Northwest, North Central, and beyond step on the field. It took only a round of play for things to get wild at Queen City Tune Up, with both #6 Massachusetts and #12 Pittsburgh going down, to #25 Virginia Tech and Maryland, respectively. Those were the first of 13 total upsets in pool play. While seeding is always shaky at this point, even disregarding that, surprises like #20 Connecticut beating #5 Michigan, only to lose to Northeastern were demonstrations that there was an underdog energy in the air. Ultimately, it was a winning weekend for the Atlantic Coast, with strong results from regional leaders, #2 North Carolina and #8 UNC Wilmington, the tournament’s only undefeated squads, as well as #23 NC State, Virginia Tech, and Maryland. Meanwhile, #10 Auburn also looked strong, suffering a close and somewhat controversial loss to UNCW in pool play. It’s unfortunate that Sunday rains rolled in with too much strength for continued play in the bracket, cutting the tournament short about midway through the quarterfinal round. For all the juicy details from Charlotte, check out our Queen City Tune Up tournament recap. 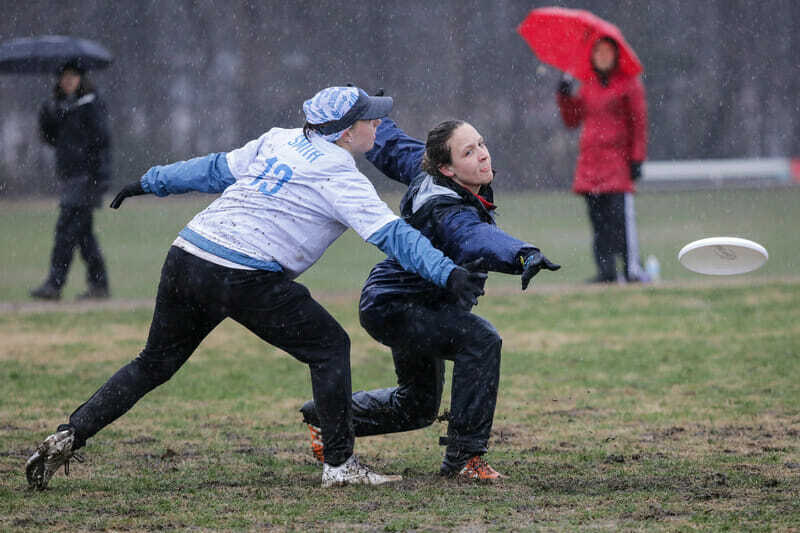 Presidents’ Day Qualifier went mostly to seed, save no. 6 seed Las Positas upsetting no. 4 seed UC Santa Cruz in quarterfinals; top-seeded Santa Clara claimed a 12-7 victory over no. 2 seed Chico State in the final. Illinois was the surprising victor of Mid-Atlantic Warm Up, surviving a double game point semifinal with Richmond and a 13-11 matchup in the final with Dartmouth. With top D-III teams in action, read on to our D-III Update for more details. No. 3 seed Texas State made an impressive 9-0 run through Big D in Little D Open to win the event. They went through the only other undefeated teams to that point to do it, taking down last year’s champ, Texas Tech, in the semifinals and Texas-Dallas in the final. This weekend was the first bit of major action for D-III men’s teams on the East Coast, with several teams in action in Williamsburg, VA for Mid-Atlantic Warm Up. Despite starting the weekend with a surprise loss to Rutgers, #10 Dartmouth Pain Train finished the highest of all D-III competitors, eventually losing 13-11 in the final to a strong Illinois team and ending the weekend 5-2. After an undefeated pool play performance on Saturday, #4 Richmond Spidermonkeys suffered back-to-back double game point losses in the semifinals and third place game to Illinois and Ohio State, respectively, to also finish the weekend 5-2. Elon Big Fat Bomb and Williams WUFO both worked through the ninth place bracket before facing off in the ninth place game, where Williams came out on top 10-8. Meanwhile, several hours south in Charlotte, NC, the #14 UNC Asheville Bulldogs had a rough time against D-I competition at Queen City Tune Up. Traditionally a tournament where D-III teams are able to grab a few big wins, the Bulldogs went 0-5 for the weekend, including a brutal 11-0 beating from Pittsburgh. UNCA’s biggest strength the past two seasons has been a consistent O-line, so their inability to at least score holds this past weekend is concerning for their prospects of returning to Nationals. While all of these results will decay significantly before the final rankings are determined, the New England region has a head start over the Atlantic Coast in the battle for strength bids. This weekend, our attention turns back to the West Coast, where most of the top teams from that half of the country will be in action at the Stanford Open. With seven teams from our top 25 in action, including #1 Air Force and #2 Colorado College, we should see plenty of high level inter-region action and further connectivity between a lot of the top teams in the division. Stanford Open (M/W) is the headliner, the launchpoint for a number of key west coast players. With 36 teams, the men’s division is pretty massive, with UC Santa Barbara as the no. 1 seed. But there’s a wealth of challengers, including D-III #1 Air Force, and dangerous teams like Cal and UT-Dallas. The no. 1 seed in the women’s division is UC Davis, but note D-III #3 Carleton Eclipse is the no. 2 seed. BYU’s presence complicates the bracket, but they have been strong thus far. Luminous (W) brings together 16 teams, with no. 1 seed Clemson at the top. However, Auburn, Harvard, and Case Western could make for formidable foes, though it may ultimately be the rain that wins this one. Comments on "College Update: Queen City Tune Up, Mid-Atlantic Warmup, Prez Day Qualifier"